Eastern wolf (C. l. lycaon) is relatively small, with males weighing on average 67 pounds and females 53 pounds. They have longer ears and a narrower snout. They tend to be mottled gray. Great Plains wolf (C. l. nubilus) is much larger, with males weighing on average 100 pounds. They have shorter ears and a broader snout. They can vary from black to white, though most are gray. Great Lakes boreal wolf (C. l. lycaon x C. l. nubilus) mostly has intermediate traits, grading form more C. l. lycaon-like in the east to more C. l. nubilus-like in the west. Mostly white-tailed deer, but also beaver, other mammals, and wild fruits. Sources: 7, 15, 29, 76. In 1966, Congress passed the Endangered Species Preservation Act. A year later the gray wolf was classified as endangered. At that time only a few hundred remained in extreme northeastern Minnesota and a small number on Isle Royale, Michigan. In 1978, it was classified as threatened in Minnesota only. Due to a significant increase in their numbers and their range, it was reclassified as special concern in 1996, delisted federally in 2012, and delisted in Minnesota in 2013. The delisting was controversial and in 2014 it was relisted in Michigan, Wisconsin, and Minnesota. 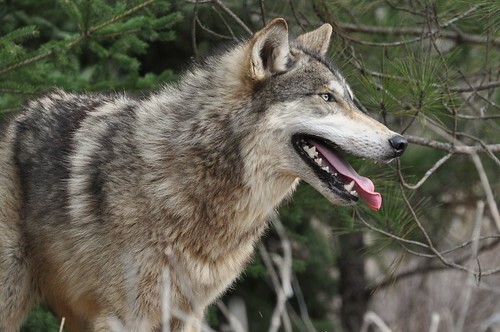 Debate continues about whether there are different species of gray wolves in the world. In 2000, Wilson et al proposed designating the eastern wolf as a separate species, Canis lycaon. This proposal was not widely adopted. Eastern (timber) wolf (C. l. lycaon) was originally found in the northeastern corner of the state. Great Plains wolf (C. l. nubilus) was originally found in the western counties, with hybrids occurring between the two. The dispersal ranges of the two subspecies overlap considerably and much hybridization occurs. The original genetic purity of the eastern and western population remains unknown. While is likely that genetically pure populations occur at the ends of the respective Minnesota ranges, the current Minnesota population consists mostly of hybrids of the two subspecies, known informally as Great Lakes boreal wolf, with more C. l. nubilus traits in the west and more C. l. lycaon traits in the east. Source: Mech, L. D., What is the taxonomic identity of Minnesota wolves? Canadian Journal of Zoology 88: 129-138. This is a Gray Wolf named Sheriff from the Minnesota Wildlife Connection. He was brought in to be photographed at the Spring Break event held by the Twin Cities Area Counsel of Camera Clubs. The Gray Wolf (Canis lupus; also spelled Grey Wolf, see spelling differences; also known as Timber Wolf or Wolf) is a mammal in the order Carnivora. The Gray Wolf shares a common ancestry with the domestic dog (Canis lupus familiaris), as evidenced by DNA sequencing and genetic drift studies. Gray wolves were once abundant and distributed over much of North America, Eurasia, and the Middle East. Today, for a variety of human-related reasons, including widespread habitat destruction and excessive hunting, wolves inhabit only a very limited portion of their former range. Though listed as a species of least concern for extinction worldwide, for some regions including the Continental United States, the species is listed as endangered or threatened. IF U LOVE WOLVES PLZ ENJOY IT!! SAVE THEM!! There were four adorable woulf pups, just one week old. The entire pack works together to care for those young pups. In the Valley of the Wolves, an amazing wolf documentary for kids, you'll learn how the successful reintroduction of Yellowstone's apex predator has changed the entire ecosystem of the park, and about the threats that wolves continue to face on their road to recovery. The following year, a second wave of gray wolves was brought to the park from British Columbia, Canada; five of them were released together, and they were named the Druid Peak pack. Since the arrival of those first immigrants, wolves have thrived in Yellowstone - and none more dramatically than the Druids. The epic history of the Druids, one of more than a dozen packs now occupying the 2.2 million acres of Yellowstone, is being presented in this grey wolf documentary full (NATURE's In the Valley of the Wolves), was produced and shot in High Definition by Emmy-award winning filmmaker Bob Landis. The grey wolf or gray wolf (Canis lupus), also known as the timber wolf or simply wolf, is a mammal of the order Carnivora. It is the ancestor of the domestic dog. A recent study found that the domestic dog is descended from wolves tamed less than 16,300 years ago south of the Yangtze River in China. Wolves live in groups called "packs". The members of the pack are usually family members, often just the parents and offspring. Grey or gray wolves that are not family may join if they do not have a pack of their own. Packs are usually up to 12 wolves, but they can be as small as two or as large as 25. The leaders are called the alpha male and the alpha female. Their territory is marked by scent and howling; they will fight any intruders. Young wolves are called 'pups' or 'whelps'. Adult females usually give birth to five or six pups in a litter. A few years ago some gray wolves were put back into Yellowstone National Park in Wyoming to breed, because they were becoming endangered. The wolves have been very successful in the park. There had been no wolves there for a long time, because of hunting and poisoned water. Many people were not happy about this because they were afraid that the wolves would eat the sheep and cows near the park. However, wolves only eat livestock when they can not find wild prey. This wolf video, one of best wolf videos for children, has been created under Common Creatives. All rights belong to their respective owners. Animal Life TV gives you the chance to watch a broad range of animal documentaries like: wolf videos, wolf videos for children, wolf videos for kids, best wolf video, wolf documentary, wolf documentary for kids, wolf pack documentary, wolf documentary yellowstone, wolf documentary full, grey wolf documentary full, grey wolf documentary, gray wolf documentary, nature documentary history of wolves in Yellowstone documentary and Yellowstone National Park documentary and video for kids.